As President of Studio T Urban Dance Academy & Founder of The California National Day of Dance, Tamaira “Miss Tee” Sandifer’s heartbeat is to champion the development of every child she can to build confidence, character & a conquering spirit that believes anything in possible. She serves over 5,000 youth in school districts throughout Northern California every year through educational partnerships & enrichment programs related to physical as well as mental & emotional health. Sandifer’s mission is to instill real life skills, hope & a sense of belonging to her students. Dance is the vehicle; her choreography includes a bold coaching style that triumphantly declares to each family and school she serves: DREAM BIG. Her passionate advocacy for the arts has taken her to the State Capitol where she partners with local and national civic leaders to bring arts-inspired, socially and culturally relevant incentives to the academic day. She works closely with Assembly members to ensure the arts are available, even in communities that are starved for programs. She created the idea of The California National Day of Dance to highlight the diversity and the power of unity through creativity. Studio T produces Hollywood’s most sought after young dancers including THE 2016 winner of ‘So You Think You Can Dance’, 2018 World of Dance stars, members of the Jabbawakeez Her graduates currently travel the world with artists and celebrities that include: Justin Beiber, Jennifer Lopez, Selena Gomez, Rihanna, Chris Brown, Usher, Beyonce, Bruno Mars, Ellen & More. You’ll see her graduates on the stages of MTV Music Awards, Nick Choice Awards, BET Awards & more. As an entrepreneur, educator, speaker & innovator her message is simple, serve, give from the heart, love hard, and DANCE! Tamaira Sandifer knows that there is power in the dance. As a business owner & founder of programs that specifically work with youth, she’s seen the benefit of dance in their everyday lives of youth who need a creative outlet, and a means to stay off the streets for so many in impoverished communities. At one point this powerhouse and business dynamo had her own struggles with poverty. Raised in the Bay Area, by a single mother she is living proof that you can achieve your dreams. She’s been dancing and choreographing since the age of 7 years old. Growing up in Richmond, California, dance was a primary form of entertainment for her family as extra-curricular activities were luxuries they could not afford. There were no dance programs in her community so the television became her teacher; MTV and dance masters Michael Jackson, Janet Jackson, Paula Abdul, and many others became her instructors through music videos. She thrived in this tough environment, forcing her to grow in problem solving, creativity and innovation. These same giftings are used to impact the many cities she has planted roots in today. By the time she graduated high school, her passion for the arts created opportunities that propelled her into multiple successful entrepreneurial art based careers. By 2000, Sandifer was married, raising 2 little girls, and decided to relocate to California’s capital, Sacramento. She began volunteering in local churches, community centers and dance studios teaching urban arts. She quickly built a following that outgrew many of her volunteer spaces. She also developed the reputation as a no nonsense coach who gets results from even the toughest of youth candidates. Her mission became clear, to impact as many young people as she could, through the arts. 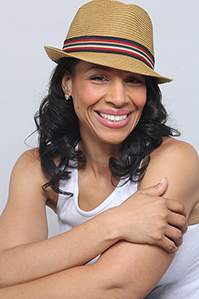 In 2005, Ms. Tee’s popularity demanded that she establish herself and this mother of three started her dance business, Studio T Urban Dance Academy, and non profit Miss Tee’s R.E.A.C.H. (Recreation Education Arts Career Health) Academy, formerly 3.0, Incorporated. She added a family component called S.T.E.P. (Studio T Empowering Parents) and now offers FREE workshops that help dance families grow in family management learning skills like budgeting, debt freedom, meal planning, How To Not Go Broke At Christmas, and much more. The result: youth and their families are painted a new vision, with a desire to thrive outside what they see on their 'blocks'. The effectiveness of this recipe has been proven time and time again as her young protégé’s take on the world through dance and their pursuit of higher education. She & her dance teams have won international & regional Hip Hop dance titles as well as voted ‘’Best of Sacramento’’. Through her work with the juvenile Youth Detention Facility, she won ’Volunteer of the year’. Today, after more than three decades of dedicated teaching, Tamaira and her team continue to build quality programs to build our youth, our cities, and our educational and correctional systems through the ARTS. Dance Captain Miss. Hannah (21) has been dancing at Studio T Urban Dance Academy since the age of 12 years old and has been teaching since 16 years old. Her dream was to always be a dance teacher, but never would of thought she would be doing it in the capacity she is today. She travels all around Sacramento reaching students in Schools, Churches, Community Centers, Libraries & more. Her favorite style of dance is Hip Hop and in class watch for her “shoe game”! Studio T has changed and improved her life, not just her dance skills. Her self confidence, respect, and honor has led her to reach dreams and goals that was once just a wish, but has now turned into reality. Now she is helping and teaching her students in the same way, in that, it is much more than just dance. Her fashion sense, communication skills, work ethic, school grades, and giving of herself has developed and improved over the years at Studio T. It has also helped her emotionally while being raised by a single father and growing in her relationship with her mom and siblings through out time. Studio T has been one of the very few consistent aspects in her life. In her dance career at Studio T, she has performed, traveled, and trained at work shops across the country, such as Pulse, LA Hip Hop Intensive, Monsters of Hip Hop, and BuildaBeast and will one day be traveling the world. She has met (I don’t know if “met” is the right word) artists Kehlani, Lecrae, DLow, Khaled, and Kamaiyah to name a few. With the encouragement and support of Ms. Tee, she has also started her own DJ business and is a Protege at the local radio station Hot 103.5. As a result of Studio T, she has a dance family and is headed into her future with a purpose. Dance Captain Miss Asia has been dancing at Studio T Urban Dance Academy since the age of 9 years old and has been teaching since 15 years old. Her dream was to always be a part of a strong team, but never would of thought she would be doing it in the imaginative and creative way she is today. Her favorite style of dance is Break Dance and Hip Hop! Studio T has changed her life for the better, not just her dance skills. Her self confidence, skilled organization, and even event coordination has led her to reach dreams and goals that was once believe to be unreachable, but has now become her life and everyday living. Now the creativity developed and giving of herself has grown, improved, and are shown over the many years at Studio T. she has found that she is not just an inspiring dance performer but artist as well. In her dance career at Studio T, a lifestyle she lives by, she has been able to perform, travel, and be trained in work shops all across the country, such as Pulse, LA Hip Hop Intensive, Monsters of Hip Hop, and most recent BuildaBeast. With the right encouragement and support of mother and coach Ms. Tee, she has also become a self taught gymnast an exploring animator hoping one day to join the team of Pixar as well and is headed into her life with a positive purpose and joy. Saida Findley is a current Senior at Sac State. Born in Los Angeles, she originally began modeling but dance was sure to follow. Training in jazz, modern, stepping, afro-Caribbean and ballet, this opened up a new world. Following high school, Saida moved to Sacramento to train and gain strength through knowledge. She is now pushing her boundaries and entering area of new comforts as she explores the new world life has place in front of her, with the help of dance. Saida’s first production at Sac State was “Ebo de Araie” choreographed by Miguel Forbes. Embodying her character, Nanu Buluku, she began what she called her journey into the Black Choreographers mind.